B, of Thursday Night Knitsters hat-queen fame, started it. B came to Tangle knitting night with the cutest little cupcake hat. It really looked like a cupcake. We all oohed and ahhhed over it. It was so cute. Alas, I have no small children to knit for, and hats are not my thing. But Alice put on her thinking cupcake-cap and went for it in a big way. She crafted this wonderful front-window display with lots of little cupcake hats “baking.” See her Mixmaster getting another batch ready? (Click on the pic for the larger version!) We all oohed and ahhhed over it. It was so clever. 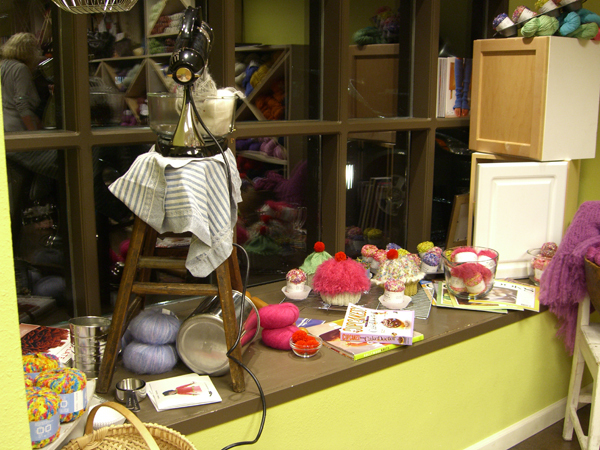 Certain colors and textures of yarn began selling out as local knitter hopped on the cupcake train. Alas, I have no small children to knit for, and hats are not my thing. I showed #1 Son the picture of Tangle’s window. Aren’t these adorable? I asked. Mom, replied my wonderful offspring, We would so wear these. Can you make four by Friday? We have a gig then. Pink. With sprinkles. So thus I was drawn into the cupcake madness. Four of these puppies… By Friday. Today was Saturday. I had six days. The pom-pom “cherries” were donated by Alice. She has this really cool little pom-pom making gadget (Susan Bates Easy-Wrap Pom Pon Maker – yes that spelling is correct). Alice is a professional pom-pom maker. I now have one of the little gadgets, too. But I will be happy to wind a simple pom-pom when necessary. I do not aspire to professional greatness. I made a few changes to the pattern. Since my hats need to be adult-sized, I cast on 88 stitches and used US#7 needles (one Inox Gray, one Crystal Palace bamboo – it was what I had on hand). 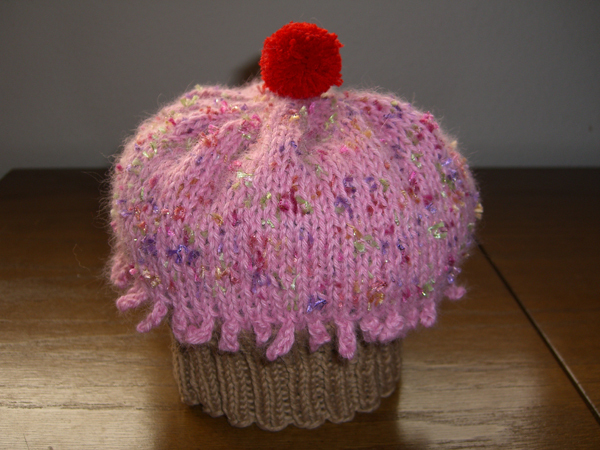 I knit the cake part for 3″ and the frosting for 4″ before beginning the decreases. Also, although the pattern says to switch colors when started the decreases, I believe that to be an error and did not do so. About 1/2 way into the “nubble” row (the driping icing edging), I realized that knitting 44 little nubbles would be the death of me, so I crocheted them. (So sue me.) Much faster, and saved my sanity. This one was completed at 2:00 AM Sunday. Three more to go. The things we do for our kids. Lest anyone wonder, I don’t know what a punk band is going to do with cupcake hats. I’m not sure I want to ask.